Why did Davies choose to start a Green Group and attain iiE accreditation? More and more attention is on the effects of global warming on our planet, and its influence on the health and wellbeing of the human race. With this in mind a team of professionals at Davies started to explore how our practice can start the process of becoming more ‘socially and environmentally sustainable’. Our intention is to more than just improve our own sustainability; we want to help other practices navigate the steps which can be taken to improve both environmental and social sustainability in their own practice. We recognised early on that pulling all our initiatives, enthusiasm and ideas together was challenging. We needed a focus and iiE offered a framework to follow and help us to systematically categorise all our efforts. What do we mean by becoming more ‘sustainable’ ? In 2010, climate change was called “potentially the biggest global health threat of the 21st century” by medical journal The Lancet. This threat to human health is indirectly and directly related to the increase in global temperatures which are a result of human activities, particularly since the industrial era. However, there are similar threats to our planet’s ecology and wildlife. Sustainable development has been defined by the Brundtland Commission of the UN in 1987n as “development that meets the needs of the present without compromising the ability of future generations to meet their own needs”. At Davies Veterinary Specialists, we would like to move towards the three pillars of sustainability; environmental protection, financial stability and social progress. These are sometimes called the triple bottom line of ‘planet, profit and people’. We believe that incorporating these principles into our business structure and daily clinical work will produce benefits for our staff, our clients, our community and our planet. We have started by identifying our initial areas of focus – energy, pharmaceuticals, waste and resource management, recycling, sustainable procurement, legal compliance, travel and leadership – and incorporating our ideas into a Environmental Management Scheme which is externally audited. We hope to increase our resilience for the future, and to share our experiences with other practices. Who is in the Davies Green Group and how did you identify your goals? The Davies Green Group was established in February 2017 by a group of enthusiastic team members from our clinician, nursing, maintenance, reception and kennel assistant teams. Once we made the decision to be audited by iiE we looked at our current activities and set our goals based on what our practice could achieve. We recognise every practice is different, but we set our initiatives to measure and meet the following goals; measuring resource use, improving recycling, reducing waste, engaging staff, and as a result reducing the practice’s carbon footprint and financial costs. In our first year, we have built on previous green initiatives by systematically assessing our activities, establishing a comprehensive environmental policy and action plan and submitting these, with relevant evidence, for audit by iiE. We also have ongoing efforts to find more opportunities to reduce the environmental impacts of our activities. STEP 2: Meet to elect a chair and to collate activities and opportunities to reduce environmental impact throughout the practice utilising the teams’ skillset. STEP 3: We identified that we needed external support, as well as Board commitment, to make meaningful audits and assessment and therefore elected for iiE membership. STEP 4: Proposing iiE membership to the Board at Davies. STEP 5: Spending 9 months preparing the audit pack for iiE. This entailed mainly setting in place infrastructure for data collection, then reporting/recording all the changes which have been made and investigating new projects, making contacts and background reading. STEP 5: Ongoing process now to continue to improve and meet our targets for reduction, with a large effort in embedding sustainability and environmental cultures into Davies management practices e.g. procurement, HR, resource use, waste management, infection control and cleaning, induction training and more. What exact initiatives have been put in place in order to reduce carbon footprint, become more sustainable and achieve iiE Silver Award status? One of our most effective initiative was to introduce Bio-bins instead of hard yellow plastic bins. This both reduced the amount of plastic used and made a financial saving of over £1200 in year one. Further initiatives we have undertaken are listed below. We will go into more detail on each initiative in our ‘Sustainable CPD programme’ to be launched in 2019. 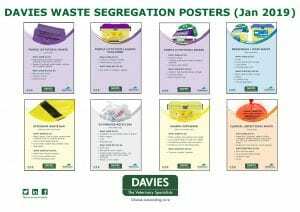 Click here to download copies of our waste segregation posters. Green Pack created for the DVS houses, detailing the DVS environmental policy, recycling and energy conservation tips. All of the above initiatives are part of our own CSR ethos and their implementation strengthens our practice’s CSR substantially. What do you mean by Corporate Social Responsibility? We recognised immediately that the initiatives we were looking at as an environmental group were directly in line with our on-going corporate social responsibility (CSR). CSR is our obligation to our stakeholders and our stakeholders include any groups/people that have a stake or interest in Davies Veterinary Specialists. This includes our pet owners, our team, our suppliers, and the communities surrounding our practice. Our stakeholders have varying needs to be met. A pet owners greatest concern may be the care of their pet they will also be concerned with our products and how we run our practice. Our team have the same concerns plus issues like safe working conditions. The community may care more about how we are limiting pollution in the local area. Overall CSR means maximising the good and minimising the bad effects our practice has on our stakeholders’, and by strengthening our initiatives through our Green Group we are positively working harder on our commitment to CSR. This is just a short insight into why we are investing in environmental sustainability and ultimately strengthening our corporate social responsibility. We will be offering CPD on this subject whereby we will go into more detail about the subject, our initiatives, how to set up your own Green Group, how to improve your sustainability and CSR plus we will talk through the direct impact our initiatives have had on our business socially, financially and environmentally.